I’ve participated in National Novel Writing Month (NaNoWriMo) three times (and won!). Of course the hard part is actually re-writing and editing your novel, which I’m not so good at. A quiet college student, Sedgewick kept to himself but saw so much going on around him. He lives with his grandmother and rides the city bus to lass and his job stocking shelves at a grocery store. He has a history of pain and loss, which quickly comes to the forefront when he meets Allison, a pretty girl with a much more immediate loss. Together they have to confront death and love. 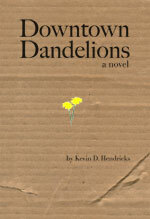 Downtown Dandelions is available as a free PDF download or a paperback for purchase. Read blog posts about Downtown Dandelions. Kara, Brick and James form a trio of survivors, the last of a now-dead community. They wander a post-apocalyptic world where humanity’s savagery has already ruined civilization and now threatens survival as well. James is always looking to the east and the hope of the promised land, Brick is quiet but strong and Kara yearns for simple hope. This young, world-weary trio encounters a man full of hope and promise—he’s either a wise guru to lead them forward or a foolish old man. Read blog posts about Least of These. Nobody likes their first day of high school. It’s even worse when you have to do it again. But when Anwyn’s sister kills herself and the family falls apart, moving to small town Kansas and starting over doesn’t sound so bad. But being back in Kansas where she spent so many summers with her family, Anwyn finds that her sister’s suicide is still a problem. Also written as a part of National Novel Writing Month, this sophomore effort is currently (and forever) being edited.